Studio 13/16 + Rirkrit Tiravanija, an useful relationship. Centre Pompidou, Paris. 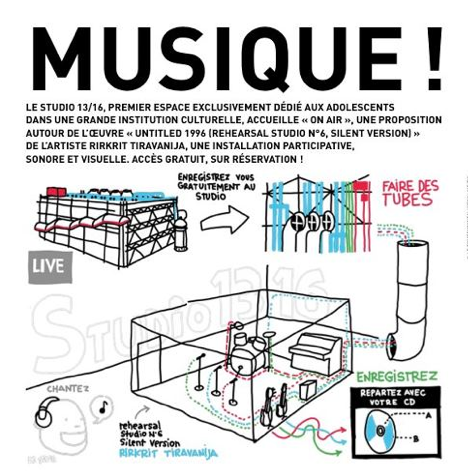 Studio 13/16 is an interactive and creation space inside Centre Pompidou, Paris, where teenagers can enjoy new and unusual experience. This summertime, Studio 13/16 offers amazing concept. The name of the artwork is “On Air”. 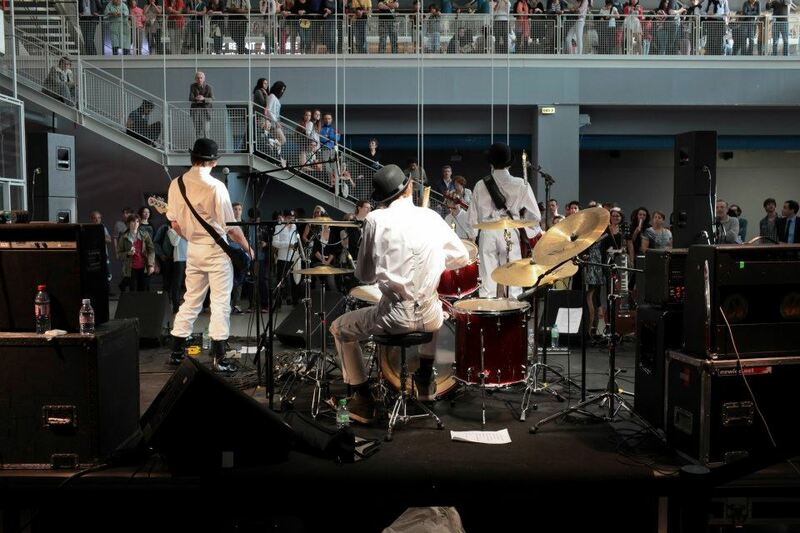 The teenagers are invited to “perform” in the work, to act, to record and to leave with a CD of their composition. “On Air” makes it possible to examine the mutual influences of the plastic arts and sound creation, and to understand how their interaction helps to invent new fields of creation. This glass bubble stands in the middle of Studio 13/16. Inside, there are four microphones, two electric guitars, bass and drums. 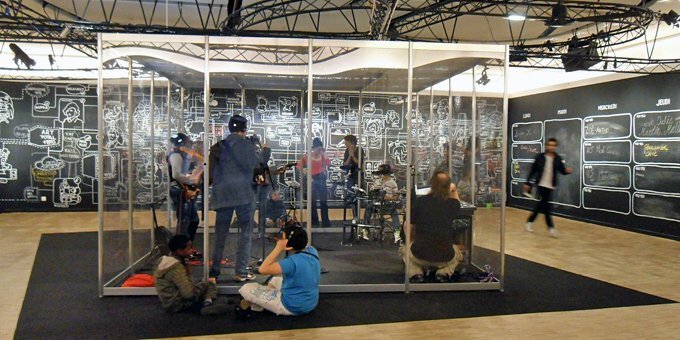 This “Music Box” is a real recording studio. Accompanied by a sound engineer, young people will enter in groups of four with and at the eand, after one hour, they have the opportunity to leave with their model on CD for free. The concepts of interactivity, conviviality, exchange and creation are coming from Rirkrit Tiravanija artist. His installations often take the form of stages or rooms for sharing meals, cooking, reading or playing music; architecture or structures for living and socializing are a core element in his work. The source of Tiravanija’s work is the everyday world of eating and socializing with friends. Studio 13/16 wanted to combine and share his values and ways of performing this concepts with Rirkrit Tiravanija, Untitled 1996-1997 (rehearse, studio No. 6) artwork. This new space offers a normally commercial service at no cost and in an unusual location. People visit to the museum but also by booking time to rehearse and have fun.